If you lock yourself out of your Airbnb rental, don't do this! What happens if you lock yourself out of your Airbnb rental thousands of miles from home? Will your host or the caretaker immediately come and rescue you? 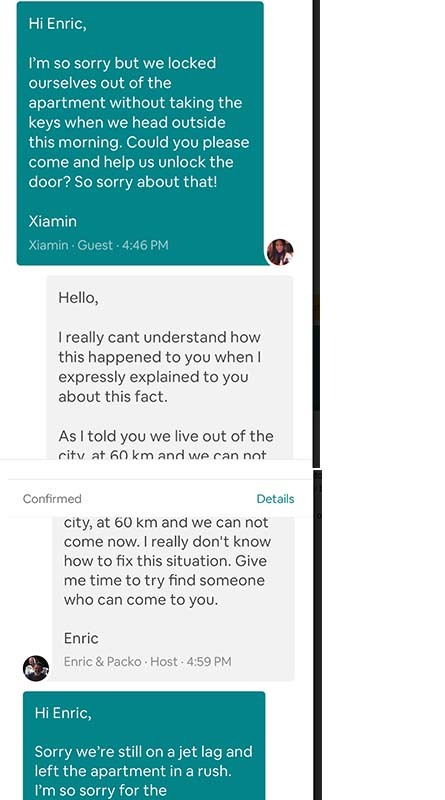 Xiamin Qi recently discovered the answer to both questions after she locked herself out of her Airbnb rental in Barcelona. Despite the host warning her about the self-locking feature of the front door, she says jet lag caused an oversight. That fatigue caused Qi to walk out of the building and leave the keys inside. Now she is asking the host to refund $500 for her trouble. But is this a reasonable request? For anyone intending to spend time in an Airbnb rental this summer, Qi’s story is instructive. It’s important to make sure that your expectations are in line with the nature of Airbnb. In this case, Qi’s assumptions about the host’s response time to her predicament appear to have been set too high. When Qi and her husband began planning their recent trip, they decided to use Airbnb for their stay in Barcelona. 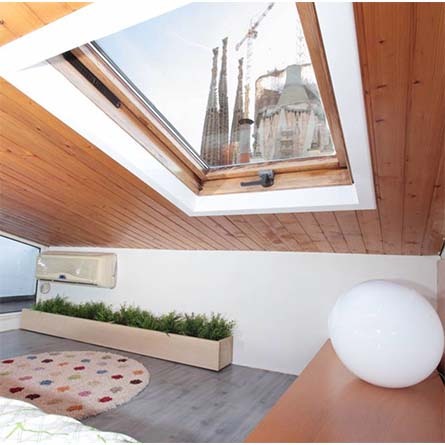 They booked a small apartment with a view of one of the most famous pieces of architecture in the city: La Sagrada Familia. The couple thought the location and apartment would be perfect for their stay. And for the first few days, it was. But on the last night of their stay, things took an unpleasant turn. And suddenly, the couple was locked out of their Airbnb rental. Standing on the street pondering their next move, Qi says she first sent a message to the owner. “Enric” responded within 15 minutes, but clearly, he was frustrated with the situation. He pointed out that he lives 35 miles out of the city and that he had warned Qi and her husband about the door and his location. Locked out of the Airbnb rental. Now what? Qi says that she and her husband went to a nearby coffee shop and waited for further instructions from Enric. Two hours later, around 7 p.m. Qi alerted Enric that their phones now had low batteries. They requested an update. And then they decided to go to a restaurant about 30 minutes away by taxi from their Airbnb rental. This jaunt turned out to be a mistake and it ended up compounding their initial mistake. At 8:50 p.m., the caretaker, Packo sent a message to the couple that he was ready to meet them with the key. But now Qi and her husband were in the middle of dinner. 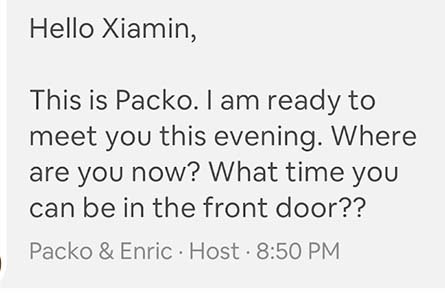 Inexplicably, Qi responded that they would not be able to return to meet Packo until nearly 11 p.m.
Just an aside here: If you lock yourself out of your Airbnb and a caretaker or host drives 35 miles to let you in — you should abandon your dinner plans. But that isn’t what Qi did. She told Packo that she would be turning her phone off to save her battery and she would check again in 30 minutes. And when she checked again — Airbnb representatives had taken over the situation. Qi received a final message from Packo when she turned on her phone again 30 minutes later. He said he had to work early in the morning and could not wait for their dinner to be over. 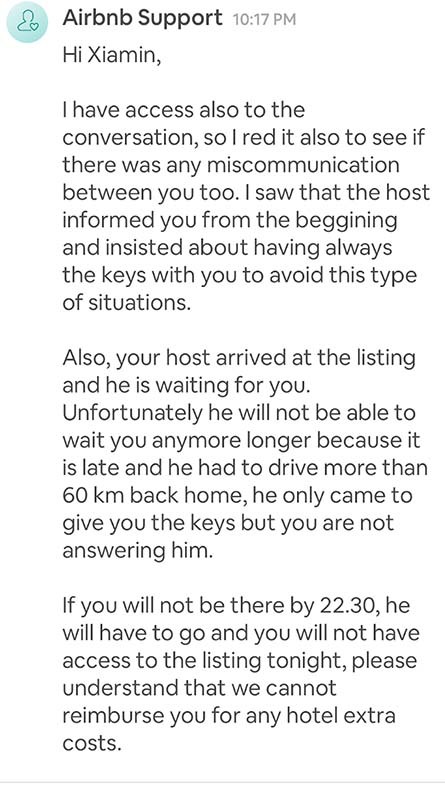 After waiting some amount of time at the building, he had contacted Airbnb. Per the resolution center’s instructions, he had left the property. Now Qi asked if he could wait until 10:45, but Packo was already driving. An Airbnb representative responded. Qi and her husband would be permanently locked out of the Airbnb rental for the night. Locked out of their Airbnb rental. Now what? The night turned really tough on us, since we were at a point without phone, passports, and a place to go. We were basically walking on the main street. We didn’t know the neighborhood at all and went in every hotel along the way to try our luck. Most hotels were either fully booked or cannot accept us since we didn’t have passports with us. After 2 hours, finally one hotel showed us sympathy and allowed us to stay otherwise we would truly [have become] homeless in a place we don’t even know. Finally settled in for the night, the couple thought about the day’s events. And they became convinced that Airbnb and the host were responsible for their situation. Now with her phone fully charged, Qi sent multiple pleas for help through the Airbnb resolution center. But Airbnb had already resolved that the couple had not been available to work cooperatively with their hosts. The case was closed according to Airbnb. But Qi felt wronged and decided to contact the Elliott Advocacy team. Our advocacy team now receives close to 1000 pleas for help each month. And it probably would not surprise our regular readers to know that some portion of these have no basis for demanding compensation. And so we do not present every case that arrives in our inbox to every company involved. It’s important for our team’s reputation to carefully consider the merits of each plea for help that we receive. Unfortunately for Qi, I noticed many problems with her complaint. First, she was asking for a full refund of her stay in Barcelona. Even if the host caused her problem, it didn’t begin until the last day of her stay. So a full refund wasn’t a reasonable request. But her situation wasn’t caused by this Airbnb host. All of her problems began with her mistake of locking herself out of the Airbnb rental. And then she compounded the problem by taking a taxi 35 minutes away for dinner. It’s not wise to leave the area when you’ve locked yourself out of your vacation rental. It’s important to stay local, as your host is likely somewhere trying to resolve your situation. Finally, when Packo sent the message that he was ready to meet Qi, she seemed to have misinterpreted him. This may be due to the language barrier. But he was at the Airbnb rental waiting to let her in. When she responded that she could meet him 2 hours later, he contacted Airbnb for help. And she had turned her phone off since it was going dead. Based on Qi’s entire paper trail, I explained to her why we could not advocate her case. She was polite and said that she still wanted her story told. She would like it to provide a warning to other travelers that Airbnb doesn’t respond in the same way as a hotel. If you have a problem, you might need to wait for help. Contact your host: Ask what you can do to help correct the problem. Keep in mind that you’ve made a mistake that will inconvenience your host (as well as yourself). In this case, the couple may have been able to take a taxi or Uber to meet the host or caretaker halfway. Contact Airbnb: Use the Airbnb resolution center for all your correspondence. It can easily be accessed through an app on your phone. Ask the same questions as you’ve asked the host: What can you do to help correct the problem? Stay local: While waiting for your “rescuer” don’t travel long distances away from the property. This is critical. Make sure you stay close by and available. Always carry a portable phone charger: An additional problem for this couple is that their phones were going dead. When traveling internationally a portable charger can be a critical piece of your travel ensemble. You can purchase a portable battery pack for less than $50 that can provide hours of battery power. Consider your need for an international calling plan: Before traveling abroad, you should contact your cellular carrier. In this case, Airbnb had called Qi but her phone could not accept the call. You may find that for around $10 per day you can have a calling and texting plan while abroad that is similar to what you enjoy at home. This can be invaluable should a problem arise with your vacation rental or any other aspect of your trip. 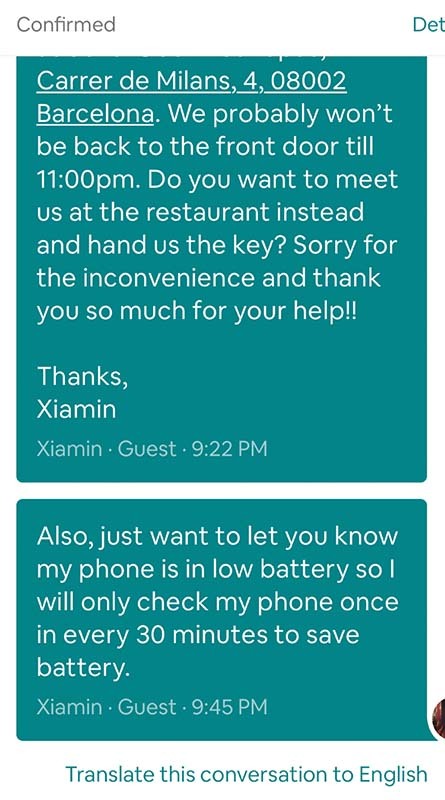 Does the host or Airbnb owe Qi anything for this locked-out fiasco?